Best Sleepover Ever: Welcome to SeaWorld! 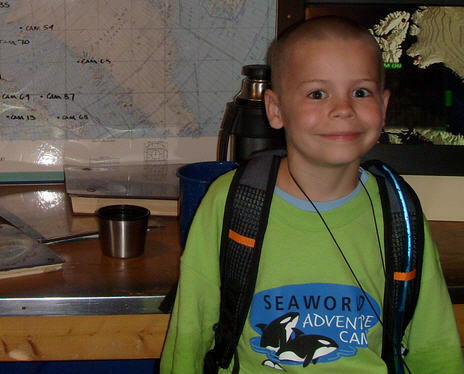 This post continues my report on the SeaWorld Adventure Camps’ Fathers Day Sleepover that my 8 year old son and I attended at the San Diego park back in June. If you missed the intro, click over and check it out first. One thing was obvious when Meadow dropped Boo and I off at SeaWorld’s back door: we were the only ones who bothered to follow SeaWorld’s packing guidelines. Judging by the “essentials” hauled in by our fellow campers—duffles, drybags, suitcases, deluxe king-sized air mattresses with their accompanying battery-powered pumps—you’d have thought they were all staying for a week. Boo and I packed lightly, for which several education staffers profusely thanked us. We had only my backpack, which contained a change of clothes for both of us and a couple of thin fleece throws. Public sleepovers at SeaWorld are a relatively new concept. Until this year, overnighters were limited to Scouts, religious groups, and other private organizations. From side conversations between staffers, I gathered that this was one of the first public sleepovers (if not the first) they had ever held, and I detected a slight anxiety in their ranks during the check-in process. Our group consisted of roughly 40 “campers” with a 70-30 kid to parent ratio. Though it was the Fathers Day sleepover, several mothers attended too. Most kids were Boo’s age and most parents were mine. After stowing our luggage in a large compartment behind the Wild Arctic exhibit, the group was divided in half. Each half was assigned a member of SeaWorld’s education staff who would play the dual role of tour guide and minder for the duration of the evening. Our guide/minder was James, a charismatic, twenty-something redhead with a palpable love for sea life and a knack for interacting with kids. Training large marine mammals to perform complex maneuvers on command looks like a tough job, but herding groups of kids through the park and commanding their attention for hours on end isn’t exactly a simple task (just ask any Scoutmaster). Extensive knowledge about the park’s vast collection of sea creatures is a given, as is the ability to deal delicately with overbearing parents and the group’s token obnoxious kid. This young cadre of staffers had its work cut out for it, and James was a natural. It was clear that we were in good hands as he led us past the massive array of water filters and paused behind a non-descript gate. Boo stood quietly, the excited wheels in his head almost visibly turning. It had been a few years since we last visited the park, but the familiar sounds and scents flooded our senses as we emerged between Wild Arctic and Journey to Atlantis into the main park. “Welcome to SeaWorld!” James bellowed.